The latest website statement from the Department for Environment Food and Rural Affairs (Defra) says ‘air pollution is expected to be ‘Moderate’ at background areas in Greater London and the south of England for the next 24 hours as a period of calm and hot weather affects the region’. It says the forecast is valid until 25 July. Defra’s monitoring network shows the running eight hour mean for ozone may have exceeded the World Health Organisation guideline in Haringey and North Kensington in the period up to 9am on Tuesday 24 July. Defra’s website statement, which is valid until 25 July, states ‘the main pollutant of concern is ozone’ and ‘the situation is expected to ‘slightly deteriorate’ for the following three days as warm weather continues and ozone pollution builds up’. Clean Air in London (CAL) understands this statement to mean air pollution could increase to ‘Moderate’ 6/10 or ‘High’ 7/10 in a number of locations in London on Wednesday and/or Thursday. Air pollution may be exacerbated after the ‘zil lanes’ begin operating for officials and sponsors from early Wednesday morning. The airTEXT health alert service is forecasting ‘Moderate’ 6/10 ozone levels at the Olympic Park on Wednesday. The Government’s health advice for ‘Moderate’ air pollution is ‘Adults and children with lung problems, and adults with heart problems, who experience symptoms, should consider reducing strenuous physical activity, particularly outdoors’. At High 7/10, the health advice to the general population is ‘Anyone experiencing discomfort such as sore eyes, cough or sore throat should consider reducing activity, particularly outdoors’. At 10/10, air pollution is described as ‘Very high’. London has had seven smog episodes so far in 2012 with the last being in late May. The Mayor of London says he has printed 150,000 business cards with details of the airTEXT service for distribution through the London Ambassadors at airports and train stations. In related news, environmental information requests by Clean Air in London (CAL) have revealed the Government’s preparations to provide daily forecast information about air pollution ‘to allow inclusion in daily briefings to the London Organising Committee of the Olympic and Paralympic Games (LOCOG) on risks to public health’ and other details. This forecast service was due to begin in early July and end in mid September. CAL hopes these briefings will be published. after a Press Release on 20 April 2011 (two days before Easter last year) received 9,100 website page views and generated [national] ‘media interest’, the Government changed its policy to release only an Information Bulletin saying ‘Ideally this should be done sooner rather than later but perhaps not over the Easter weekend if we can avoid it?’ (22 March 2012). An Information Bulletin was issued on 3 April 2012 (three days before Easter this year), after stinging criticism in The Daily Telegraph on 30 March 2012 about the lack of warnings about particle levels in March 2012, which obtained 523 website page views and did not mention ozone. CAL emphasis. 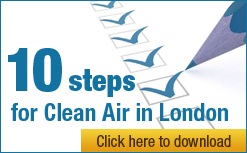 a Government minister told Ben Bradshaw MP, an air quality minister in the previous Government, on 16 April 2012, ‘Defra has also undertaken to issue a press release when the first ozone episode occurs each year’. CAL emphasis. However, the evidence shows the Government will issue only one Information Bulletin each year when one air pollutant, ozone, is expected to be ‘High’ on its (limited) monitoring network in any area. As far as CAL knows, there was no proactive warning to the general public therefore when ‘High’ ozone was reported in Sevenoaks between 22 and 29 May 2012.
a Government Briefing Note states ‘Defra has not sought to restrict or advise any other organisations on issuing air pollution alerts. Defra encourages all data providers across the UK to provide public information services for air quality including alert systems and has provided grant funding for projects like airTEXT to continue to provide a service’. However, it seems Government officials held meetings with information providers about air pollution forecasting during the Olympics with agendas such as ‘We will need to cover: Implementation of the [Daily Air Quality Index] triggers and averaging periods; Consistency in forecasting; Consistency in reporting realtime data; and Responding to press enquiries’ (10 April 2012). value was put by officials on issuing ‘a tweet’ should a ‘High’ be forecast (i.e. not ‘Moderate’) (22 March 2012). Subsequently however, ‘I can confirm that if press office used “high” as the cut off to tweet they could expect to be getting involved on around 50 days a year, which is too high. Using “very high” limits involvement to around 10-15 days which is more appropriate’ (4 May 2012). In CAL’s view, the impression is created of the Government seeking to minimise its active communications to the general public about air pollution. In legal developments, CAL solicitors have written to the Mayor of London seeking an internal review of his decision to keep secret communications with up to 11 other cities and regions in Europe on the grounds they are ‘internal communications’ and releasing them may ‘adversely affect international relations’. These communications are expected to show the Mayor has acted or is acting to weaken UK and international air pollution laws, specifically in relation to nitrogen dioxide, a toxic gas, as part of the European Commission’s ‘Year of Air’ planned for 2013. “Top UK lung scientists have a warned that a ‘summer smog’ like that in 2003 or 2006, particularly for ozone, could affect Olympic athletes in London. “Regrettably, we have a ‘perfect storm’ for smog this week with strong sunshine, very low wind speeds, easterly winds and the prospect of severe traffic congestion as the ‘zil lanes’ begin operating from Wednesday. “Lord Coe and the other Olympic organisers have done everything in their powers to ensure London is ready for the world. But it is urgent the Mayor takes a personal lead in ensuring athletes, visitors and Londoners affected by air pollution are properly warned and advised. The Government must change its ways and do the same nationally.